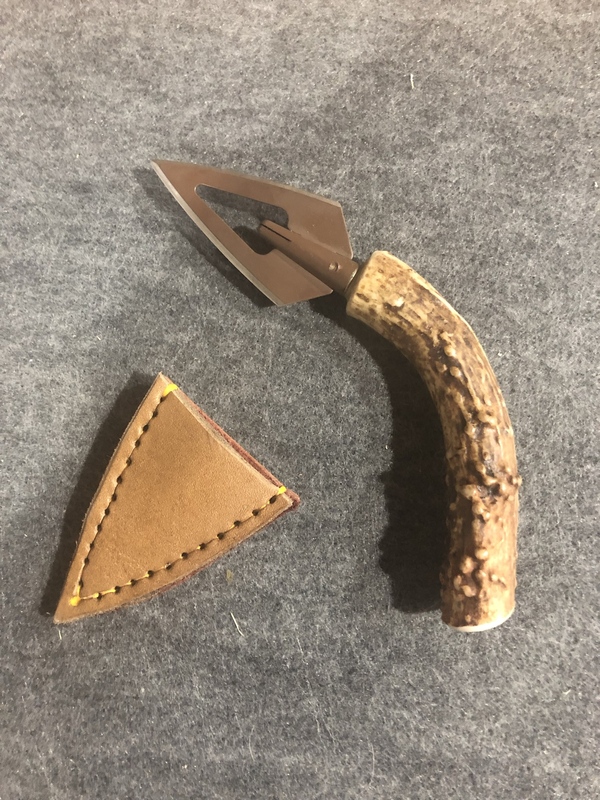 I saw an article some time ago in Traditional Bowhunter Mag about a guy making and carrying broadhead knives and I thought that would be cool to make and maybe make an armguard that would hold one. Anyone ever make a broadhead knife or carry one? Yes, they are very easy to make - just take a antler tine and cut it to a handle length you want, drill a hole to snuggly fit an arrow shaft insert, then epoxy that in with the broadhead screwed in. I made a few back in the day - I don't carry it, but rather just have a spare one just on my archery bench mostly just for cutting string, etc. I’m having a friend make a knife for my wife inspired by a single beveled broadhead. She wanted push dagger so that’s what she’s getting. My very first attempt. Pretty easy. A fine job on that neck knife i have some Grizzly broadheads that i would like to make some knives with. Also that looks like a Black Widow single arrow quiver I have one also i never thought of using that, great idea. Just check your state laws. Michigan has a law against double edge knives. Even after they repealed the switchblade law here, they kept the prohibition on double edgers. An overzealous DNR agent wrote a guy up for carrying a knapped flint knife. They then excluded flint knives from the double edge catagory, but a steel broadhead might be really iffy.